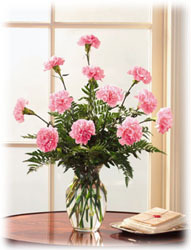 Vase of a dozen fresh cut carnations, usually arrangened with baby's breath. Available in many colors and combinations. Call 1-800-767-GRAY to order specific colors.